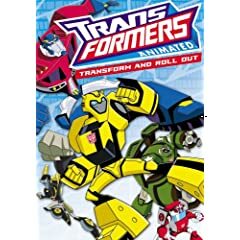 HOLLYWOOD, CALIF. – The legendary “Robots in Disguise” are back and better than ever in an all-new, super-charged adventure when TRANSFORMERS ANIMATED: Transform & Roll Out debuts on DVD June 17, 2008 from Paramount Home Entertainment. The TRANSFORMERS ANIMATED series, which airs on Cartoon Network and was developed jointly by Cartoon Network and Hasbro, Inc., has garnered out-of-this-world ratings, ranking as one of the highest rated programs in its time period on all of television among boys. Featuring the iconic Autobots and their heroic leader, Optimus Prime, the story takes place in Detroit in the 22nd century as Earth once again becomes the battleground and the evil Decepticons descend on the planet in search of the powerful Allspark. This new twist on a classic tale has all of the elements that TRANSFORMERS enthusiasts have come to love, making TRANSFORMERS ANIMATED: Transform & Roll Out a must-have for every fan’s DVD collection. Hasbro’s new line of action figures based on the animated series launches globally in June, coinciding with the DVD release, as well as a line of licensed merchandise from more than 85 companies in key categories such as publishing and apparel. In addition to the special, the DVD includes two bonus TRANSFORMERS animated shorts. Fifty light years earlier, a young ragtag group of Autobots led by Optimus Prime are in a remote sector of Cybertron cleaning space bridges when they stumble upon the most important artifact in TRANSFORMERS history: the Allspark! The Decepticons who are only scary myths for many Autobots are in hot pursuit of the Allspark; now this new band of Autobots must fight for their lives and the future of Cybertron. The Autobots are able to escape the Decepticons and crash land on an unknown planet called Earth. They land in Lake Erie and remain in stasis for 50 years. During an emergency, Optimus Prime and his young team are awakened from stasis just in time to help the new “organic life forms” (humans). But in order to save the humans and fight off the evil villain they have to convert into their robot forms! In doing so, they save the day and become new celebrities and heroes destined to fight all evil on the planet Earth and beyond! Transformers! More than meets the eye! Leave a comment telling us how you’re going to spend your summer vacations with your kids. We’ll draw three random winners from all the responses on July 13 who will get a free DVD of the movie. Contest Update: Contest is closed. See the winners page.